Those who know me, know that I love musicals. I have seen Chicago and Cats on stage but I have always wanted to see Les Miserables and Wicked. My original goal was to see either one of these musicals but when I was in London I had the good fortune to find that both musicals were playing. 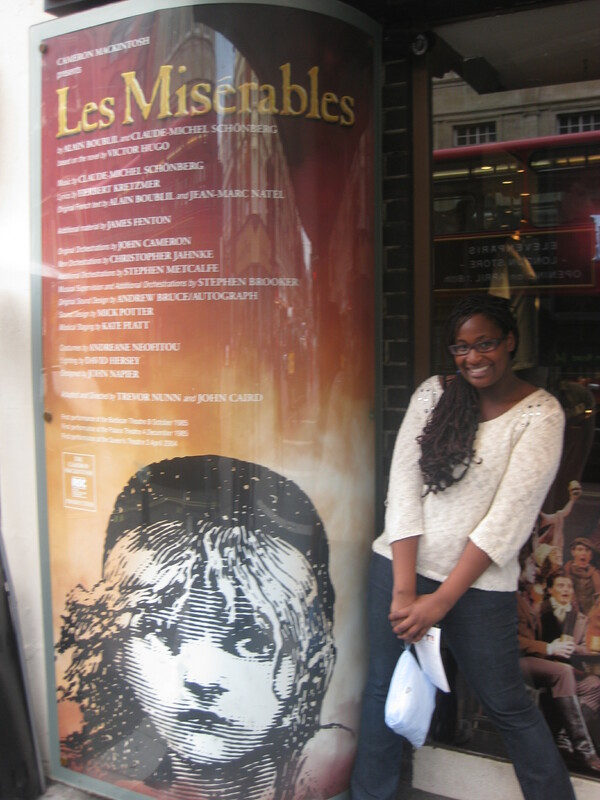 So I promptly watched Les Miserables our first night in London and Wicked on our second day. We also watched Singing in the Rain as well as Book of Mormon. Seeing these four fantastic musicals was the highlight of my trip to London! My backpacking trip begins tomorrow! Tomorrow, March 11 we truly begin our backpacking trip!!! At this point in time we are planning on hitting up, Athens Greece to do a cruise around the Greek Islands! Then we jet off to Barcelona, Spain where we will visit the Port Aventura theme park, Valencia and Madrid. Followed by a jaunt in the south of France where we will check out some beaches, up north to Bordeaux for some wine then eat macarons from Laduree at the Eiffel Tower in Paris! From there we may to go to Brussels for Belgium chocolates then to the Netherlands, followed by Berlin and Prague. We will stop by at my cousins in Germany for a bit and then head to London where we will see the cliffs of Dover. This promises to be an amazing 2 months!